Although the booklet informs us that Swedish composer Nordin “has been making improvisational music for years,” the works on this disc appear to be very precisely notated, if the extracts from the scores that are included in the booklet are to be regarded as typical. The performances certainly appear to be much more than simple improvisations. One also looks in vain for any obvious signs of the other two influences on Nordin that the writer of the booklet notes cites: the composer’s “old family of folk musicians whose musical roots stretch back at least to the provincial 18th century” or his first musical steps in the genre of punk. 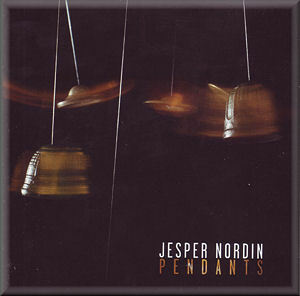 The composer told the writer of the notes that when Pendants had its première in France it “was labelled as Noise Music”. It is not clear what – if anything – is meant by this, but the implications are unfair. There is certainly a sense of the composer’s enjoyment of sound for its own sake. His fascination with these sounds is sometimes carried to extreme lengths. That said, he has a sense of what instruments can and cannot do, and there is no impression that the players are having to struggle against the natural tendencies of this in order to convey the composer’s meaning. What remains to be considered, however, is whether that meaning justifies the efforts that the indefatigable players here put into the performance of these scores. Although three of the works here – Undercurrents, Cri du berger and Pendants – add live electronics to the mix the electronics are distinctly subordinate to the live performances of the instrumentalists among whom the superlative Benjamin Carat has the greatest part to play. Mention should also be made of rich-toned clarinettist Ragnar Arnberg whose contribution to the aisle (lack of capitals apparently obligatory; is it not time this annoying “cummingsesque” habit was decently laid to rest?) blends beautifully with the string quartet players at the beginning; no electronics here. Then he launches out into a stunningly skittering series of fast-running passages before a meandering song brings the piece to a conclusion. It is not clear what, if anything, the piece is intended to convey. It is rather beautiful. Overall one gets the constant impression that the composer is allowing his fascination with the sounds he produces to get the better of him. Despite their apparently evocative titles, none of the pieces here have any programme which would allow the listener to come to grips with the often interesting sounds that the composer elicits from his live and electronic forces. The constant bending of notes and pitches comes eventually to seem like a musical tic which Nordin is using to disguise his lack of sense of direction. This is certainly unusual and interesting music, but its purpose remains unclear. This request for more guidance as to what is in the composer’s mind is not merely a whim, or a wish for a ‘prop’ to enable one to impose on the music extra-musical preconceptions. It is fundamental when one is approaching modern music, especially when the titles given to the music are clearly designed to be evocative. That is not to say that this music is meaningless. It is to say that the meaning of it cannot possibly be fully appreciated unless the composer gives the listener some pointers. There is a substantial school of thought which says that music should stand or fall entirely on its own merits. However, one really needs as much help as possible from the composer in works like these. The six pages - one in very large type - of enthusiastic endorsement in Swedish and English by Erik Wallrup, music critic of the Svenska Dagbladet, are maddeningly short on specific detail. French listeners should be warned that these have been cut down by more than half in the French translation.